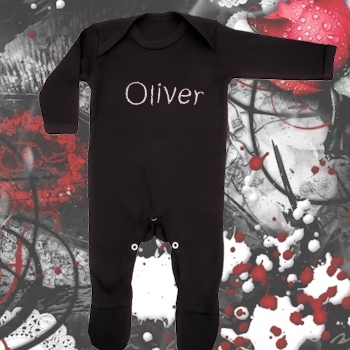 Personalised baby romper suit in solid black. Personalised baby romper suit in solid black. This jet black onesie is great for baby to play in during the day or sleep in at night. Made in the UK from soft cotton jersey material and it stretches over babies head to fit and has Nickel free easy popper fastenings down the inner legs for easy nappy changing. Personalised baby romper suit in solid black. This jet black onesie is great for baby to play in during the day or sleep in at night. Made in the UK from soft cotton jersey material and it stretches over babies head to fit and has Nickel free easy popper fastenings down the inner legs for easy nappy changing. This sleepsuit has long sleeves and fully enclosed feet. Machine washable too. Tailor made with a name, initials or nickname embroidered on the front chest in your choice of thread colour and font style. Check out the black baby hat and black bib we have to match this romper suit!